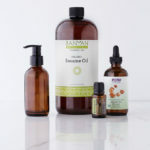 If you’re familiar with body oils, you might expect to find jojoba oil in this blend, instead sesame oil is the star and base for this moisturizing body oil recipe. I landed on sesame oil after trying all the best oils on my skin, from coconut oil, olive oil, almond oil and apricot kernel oil, to the lauded jojoba oil. Usually the results were pretty similar, a bit greasy to start, only to find myself with dry skin within a couple hours. 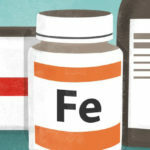 With their healing and anti-inflammatory effects, these nutrients help to soothe and noticeably rejuvenate dull or dry skin. In Ayurveda, known for it’s detoxing effects, sesame oil has been used for millennia in massage and healing treatments, including for challenging skin conditions like eczema or psoriasis. I have dry skin, and I mean really dry. To the degree that if I don’t moisturize after I shower my skin hurts and in some areas, like my shins, it will actually break and crack. This sesame based oil blend completely relieves my skin and prevents that from happening! It honestly feels like a miracle, and it’s stood the test of time and climate. Because it’s been my go-to body moisturizer for over three years now, I’ve seen it work on my skin throughout both east coast winters and for over a year now in the dry heat of Los Angeles. 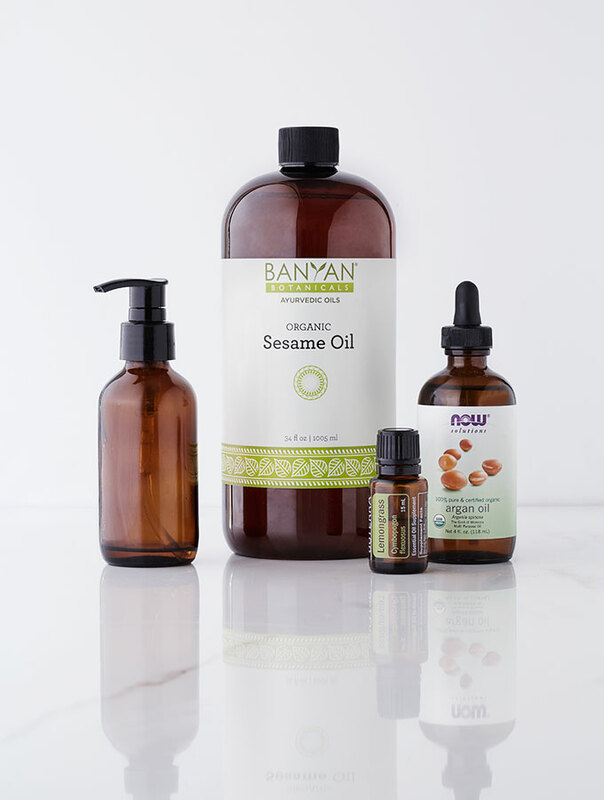 What’s even better is that this Organic Banyan Botanicals Sesame Oil is $17.95 for 34 oz (a whole lot less pricey than good quality organic jojoba), typically lasting 6 or more months. To keep the oil from going rancid simply pour enough to fill a pretty amber glass bottle and store the rest in the fridge until your next refill. I’ve only ever used Banyan Botanicals as far sesame oil is concerned, so I can’t vouch for the results with other sources of sesame oil. I say this not to get you to buy from Banyan Botanicals, but because from I truly believe Banyan Botanicals to be an integrity based company that makes products of palpably high quality (I say this also having experience with their herbs and other beauty products). According to Banyan Botanicals their sesame oil is “extracted from the seed with a natural expeller pressed method which retains its maximum nutrition in unrefined form.” There’s so little oversight in production that it’s possible that if you go with another brand, you may be getting an oil blend instead of pure Organic sesame oil, or an oil that was extracted with the use of chemicals or high heat, rendering the oils toxic and rancid. The nutrients in argan oil help to reduce inflammation and can help heal damaged skin cells. As such, it’s a great oil to use as spot-treatment on acne and rashes, or other skin irritations. The inclusion of argan oil will boost the body oil’s ability to reduce stretch marks, brake-outs and generally soothe the skin. Argan oil is much more expensive and slightly astringent, making it less moisturizing but a perfect addition to the sesame oil base. When used directly on acne it not only helps reduce inflammation, but also to balance sebum production. By adding it to your body oil, you can get these benefits all over! Last, but certainly not least, the final component of my body oil recipe is the inclusion of essential oils. Essential oils not only imbue the body oil with a pleasant scent, but a great majority of essential oils contain antiseptic, anti-inflammatory and anti-microbial properties, along with antioxidants and a long list of anti-aging and cell repairing benefits. You are by no means limited to these essential oils, but they have stood the test of time and modern research affirms that they are each effective allies in repairing skin and keeping it looking youthful. Although my body oil recipe only contains only 1 drop of essential oil to 30 milliliters of carrier oil (a ratio considered safe for Bergamot, the most photo toxic EO), it would be wise to bare in mind that a few essential oils may best to avoid in formulas intended for daytime use. This whole-body oil recipe is an affordable way to regularly moisturize your skin with a deeply healing blend, that will also balance sebum production and restore aging skin. Pour all ingredients into a dark amber or cobalt blue glass bottle with nozzle. Store in a dark, cool cupboard. Shake before use. Apply liberally to skin.